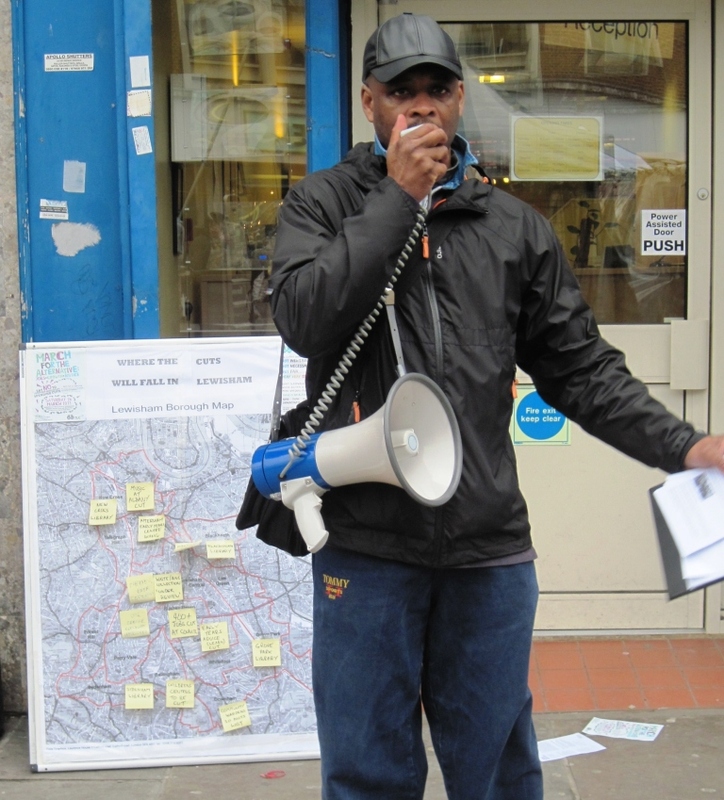 Today's SERTUC Day of Action against cuts encouraged unions and campaigners to get out onto the streets across London and the South-East. 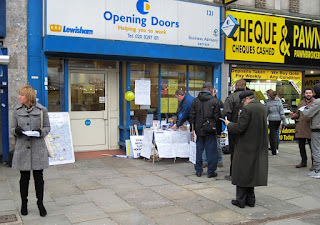 In Lewisham, over twenty campaigners, including members of PCS, NUT, UNISON and the Trades Council, gathered outside 'Opening Doors', the unemployed advice centre in Lewisham High Street that is facing closure. 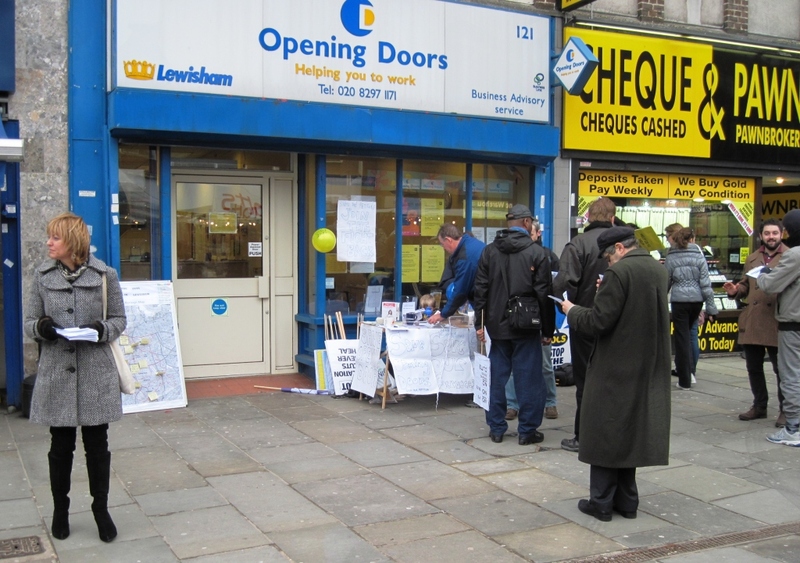 Hundreds of leaflets were given out publicising our Lewisham 'Carnival Against Cuts' on February 19 and the national TUC Demo on March 26. The NUT brought a map showing where the cuts will fall across Lewisham - especially cuts to over 400 jobs, library closures and big cuts to Early Years. 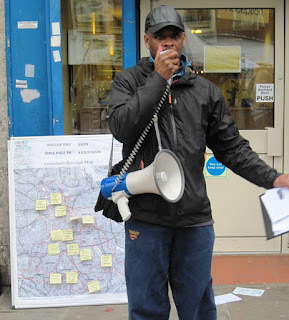 Since the Council announced after Xmas that their cuts target for 2011/12 had gone up from £20M to £33M, the nationally renowned Lewisham Early Years Advice and Resource Network has been told it faces the axe. Next week, all staff in the Four Children's Centres Areas have been called to meetings to discuss 'their future'. We fear that they will be told that huge cuts are to be made. Teachers and parents will not accept these cuts without a fight. We are preparing a campaign to defend Early Years - such a vital start to education for all our youngsters. That's not the only big battle now in the offing. Last week, unions were also told that the Council wants to slash terms and conditions, including cutting redundancy pay, adding an hour on the working week, cutting holidays and freezing annual increments. These attacks are already spreading from borough to borough across South London - unions have to stand up to them in Lewisham.